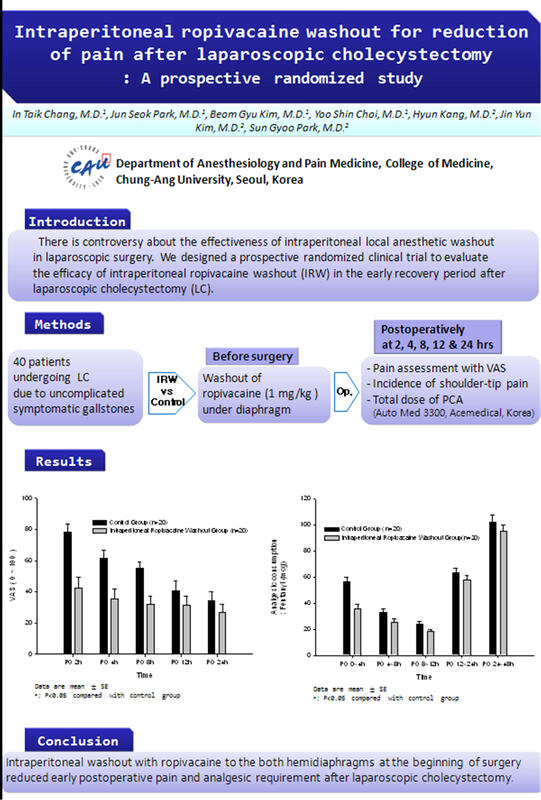 Introduction: There is controversy about the effectiveness of intraperitoneal local anesthesia in laparoscopic surgery. We designed a prospective randomized clinical trial to evaluate the efficacy of intraperitoneal ropivacaine washout (IRW) in the early recovery period after laparoscopic cholecystectomy. Methods: A total of 62 consecutive patients undergoing laparoscopic cholecystectomy due to uncomplicated symptomatic gallstones were randomized to the IRW or control group. In the IRW group, ropivacaine at body temperature (30 ml/kg of body weight) was irrigated under diaphragm before surgery. The fluid was evacuated via the passive-flow method through a close drain for 24 hours. Postoperatively, pain was assessed with a 100-point visual analogue scale (VAS) at 2, 4, 8, 12, and 24 hours. The incidence of shoulder-tip pain and total dose of patients controlled analgesics (PCA) were also recorded. Results: Mean VAS scores were significantly lower in the IRW group than in the control group from 2 to 8 hours after LC (54.90 versus 31.85; P = 0.02). Pre-emptive application of ropivacaine significantly reduced the postoperative dose of PCA at 2, 4, and 8 hours after surgery (32.9 versus 25.4 mg per 8 h; P = 0.043). The consumption of PCA as well as the pain score was lower but not statistically significant in patients in IRW group compared with those in control group from 12 to 24 hours following surgery. However, preoperative application of ropivacaine did not reduce the incidence of shoulder-tip pain and complication related with PCA use. Conclusion: Intraperitoneal irrigation with ropivacaine to the both hemidiaphragms at the beginning of surgery reduced early postoperative pain and analgesic (PCA) requirement after laparoscopic cholecystectomy.